Roses are my favourite flowers. I love all sorts of flowers (peonies, sunflowers, lilac, wisteria, lilies, freesias etc etc) but I always come back to roses. Oddly, though, I don't like red roses. They've always meant bad luck to me. My favourite colour is pinky-orange, though I'm also a big fan of all the pinks, oranges, yellows and whites. My great-grandmother loved roses. She planted a beautiful rose garden when she lived in the house I grew up in as a little girl. 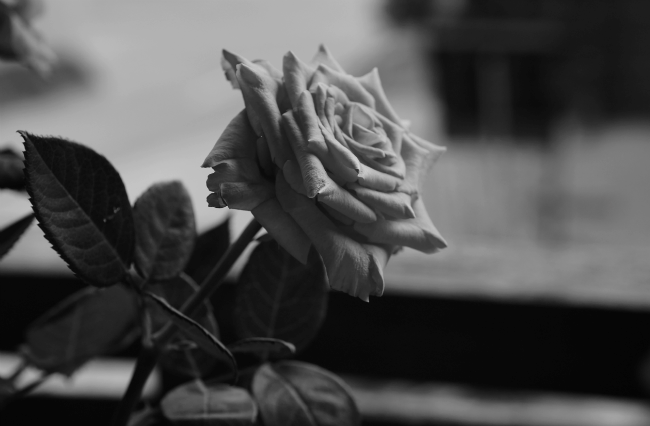 I think that was when I started loving roses. 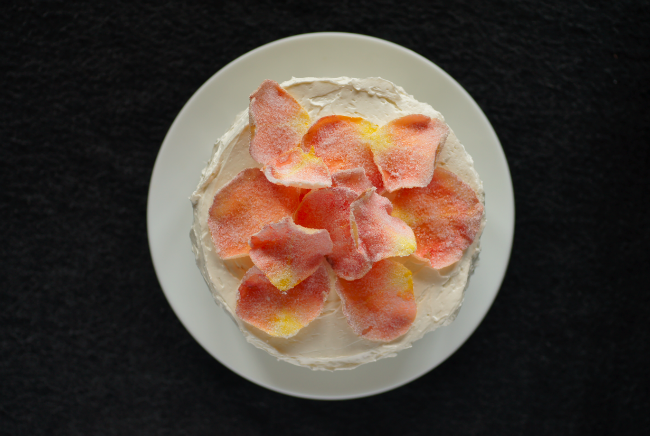 I've made sugared rose petals to decorate a cake before - an Espresso, White Chocolate and Rose Cake. They're so simple but striking. As it involves raw egg white you need to be quite careful. I want to try some tests of using other things to sugar them so they're safe for everyone. I felt the need to make a layer cake the other day. No reason or occasion. Pistachios are so amazing. I love the complexity, the colour. 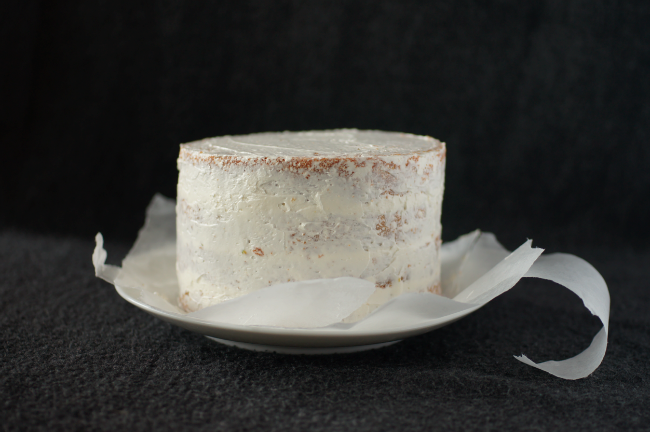 Swiss meringue buttercream just felt right with this breezy, romantic cake. It's so light. I didn't add much rose water to it - just a hint, a quiet note. After all the chaos in the world and particularly the UK this week, this cake felt innocent and peaceful. Just like the days I spent as a toddler sitting in my great-grandmother's rose garden. Preheat the oven to 170C. Grease two 5" round tins. Beat the butter and sugar until pale and fluffy. Sift the flour and baking powder into the bowl and add the eggs and pistachios. Beat to combine. Divide between the two tins. Bake for 20-25 minutes until a skewer can be removed cleanly from the centre. Cool in the tins for 5 minutes then remove to a wire rack until cool. To make the sugared petals, carefully pull the petals off the rose. Discard any bruised or brown petals. Separate an egg and put in a small pot. Put the sugar in a small bowl/pot. Using a paintbrush or pastry brush, lightly cover a rose petal in the egg white. Either carefully press the petal into the sugar or sprinkle it on. Put to dry on a sheet. Repeat for all your petals. Leave to dry for about 30 minutes or until fairly hard before using. 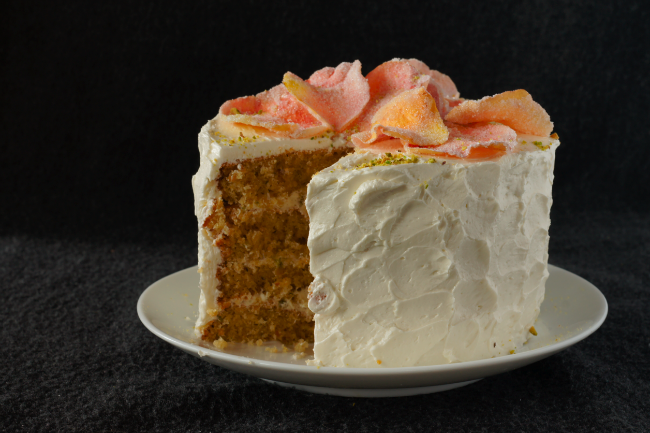 If you're nervous about making the buttercream, look at Whisk Kid's tutorial first. When you're ready and have all your ingredients set out, combine the whites and sugar in a medium heatproof bowl and place it over a pan of simmering water. Whisk until the temperature hits 70C/160F and the mixture is smooth (check by rubbing a little between your fingers). Transfer to a stand mixer (or just use a hand whisk with the same bowl) and start whipping on medium-high. Whip for about 8 minutes - it should be really thick and glossy and gorgeous. Check that it is room temperature - if not leave it for another minute or two slowly whisking. Turn the speed back up to medium/high and add a piece of butter (should be about tbsp sized pieces). Whisk until totally incorporated, then add another. Repeat until all the butter is used. At this point if it looks soupy and thin, pop it in the fridge. If not, keep whipping until it is thick and luxurious again - this can take quite a while. When ready, whip in the rose water teaspoon by teaspoon, checking after each addition for taste. Split each of the cakes into two. Place four strips of greaseproof paper on your cake plate and then place one of the layers on top. Remove 1/3 of the butter cream to another bowl and fold in the pistachios. Spread a 1/3 of this pistachio buttercream over a layer. Repeat with the rest of the layers. Use some of the remaining plain rose buttercream to smooth a thin layer of icing over the cake - a crumb coat. Place in the fridge for 10 minutes. Finally use the remaining butter cream to put a final coat of icing on top of the crumb coat. 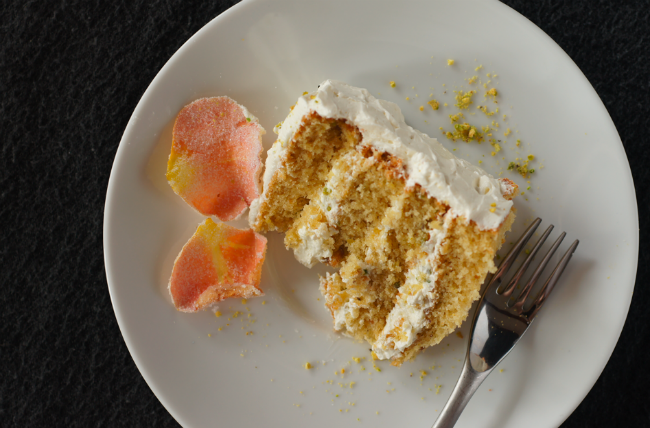 Arrange the rose petals on top of the cake and sprinkle with a few remaining pistachio crumbs if desired. Lovely and dainty. Ode to the mention of UK too. I shall make this without the petals unless I can find someone with a garden and some roses in Singapore! Aw...This looks wonderful... It is my friend's birthday on monday and she's an excellent baker, and I am making the surprise cake... (the pressure for the amateur!!) The pistachio sounds extra special - is it intensely pistachio-y? If you have a esp recommend post/recipe for a birthday cake please let me know!! Otherwise I think I will go for this one or your strawberry layer cake! gorgeous! i love the sugared flower petals. oh my wow, i want this now! your cake looks amazing and sounds wonderful! Rose water is one of my fav flavorings! Love your photos! Just wanted to say I love your blog, I love your recipes and I love your photography. Your blog is my favourite and I love hearing about what you've been doing out of the kitchen as well. I tried to improvise a recipe yesterday and used your syrup as a base. THANKYOU!! Your blog is a great resource for lots of little things I've never done before. Here is the cake I made. gorgeous roses and stunning cake. i recently sugared roses two ways...one using vodka--it evaporates quite quickly and the other way, which produce a much more beautiful finish, meringue powder mixed with a bit of water...i had no worries of raw egg white with them. it is 6 weeks later and my petals are still fragrant and beautiful. This is a very beautiful cake. I also really like pistachios. 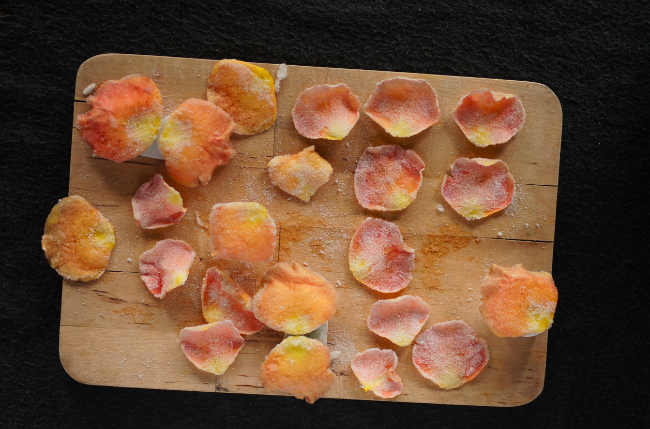 I have never tried to make sugared rose petals, thanks for sharing. Such a gorgeous cake, I love the sugared rose petals too. I love roses too, yellow roses are my favourite as they remind me of my great-grandfather who used to grow them. pickyin - hehe I had a great mental image of you going out ninja-like at night searching for some garden roses in Singapore! Hope you're having a lovely time there. Maria - So sorry I didn't get to this on time to reply. I hope it went well whatever cake you decided to make. I think most excellent bakers are really honoured when someone makes them a birthday cake - it doesn't always happen (Steph from Desserts for Breakfast calls it the Baker's Curse!) and it's always such a lovely thing to receive. Steph - thank you lovely! They're so pretty - better in real life I think. Courtney - hehe thank you! Glad you like it. The Procrastobaker - thank you so much for your lovely words! Orangey roses are so stunning. I had one outside my bedroom as a teenager that was just utter perfection. Jenny Peyton - thank you! What high praise - it's so wonderful to hear that this blog can be useful and inspiring. Your strawberry charlotte looks absolutely delicious! Christy - ooh thank you so much for telling me - very interesting. I hadn't thought of meringue powder - brilliant! I'll definitely try that. Jennifer (Delicieux) - what a sweet little story - I find the flowers we love are often linked to loved ones. Thank you for your comment & liking the cake. I can picture you sitting in your Grandma's garden. Too cute :) Such a lovely cake! What a beautiful post; I felt calm just reading your words, scrolling through the gorgeous photos :-) The sugared rose petals look beautiful and the cake moist and light - I never normally attempt layer cakes this high but think this warrants a bit of special occasion baking! Oh Emma, it looks so amazingly graceful! I'm definitely going to make this one! thelittleloaf - do give taller layer cakes a go - they're not nearly as hard as they look. Thank you for your lovely comment! Asta - do email me if you do! I'd love to see. Claire - they work together really well - very deliacte but somehow earthy. Hehe I love the image of various foodies around the world sneaking into rose gardens! Pistachio and rose is always such an elegant combination. The rose petals on top of your cake are stunning! Lucy - I often associate flavours with words and elegant is definitely right for both of these. Glad you like it! What a splendiferous cake, it looks amazing and I bet tastes fantastic. I've only had a go at making meringue icing before and it was a dismal failure. I love roses too and set rose for this month's We Should Cocoa challenge, but I think it's phased people somewhat and with 4 days to go, I've not had many entries. Choclette - Did you keep whipping it for ages and ages? Mine often looks truly awful before it whips into shape. I hadn't seen that this month's We Should Cocoa was roses - that's a really nice idea! Shame about the entries, I suppose it is unfamiliar ground to most.